Since installing the ES4 and replacing our shower, so that we use the bath less often, we have managed to reduce our water usage from 40 m3 to 24 m3 in six months, which shows how easy it is to make significant water savings at home. The Koppermann family had been on a water meter since moving into their home in Canterbury, Kent, which helped them to monitor their water usage and meant that they were only paying for the water they used. 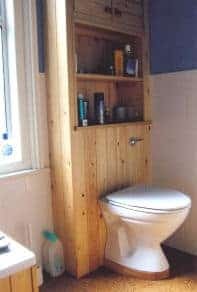 Their existing toilet was using large amounts of water and they were keen to change this. Initially, they installed a water saving device in the cistern but this kept getting blocked and did not reduce the water usage enough to make a significant difference. In addition to this, the toilet was difficult to maintain and did not flush properly, making it even less water-efficient.